Well it's been over two years since we've had Lovin' Scoopful light ice cream on the blog. I tried their so good cookies & cream and yummy cake & cookie dough and while they both had their good points, the texture of the ice cream was off, something I blamed on the old grocery store they came from. This is caramel chocolate heaven and I choose this for two reasons. One, this seemed to be the go to flavor when I did some research after my initial lovin' scoopful review. Two, I've come to realize that there aren't a whole lot of chocolate and caramel flavors out there. Wow, it's certainly look great. 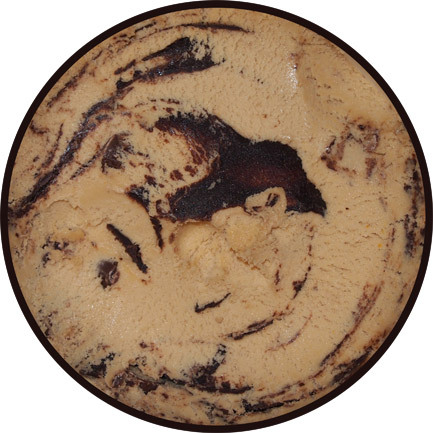 I love the look of a thick, solid fudge swirl, especially one that looks like I should hit it with every scoop. Looks really appetizing doesn't it? But look close. 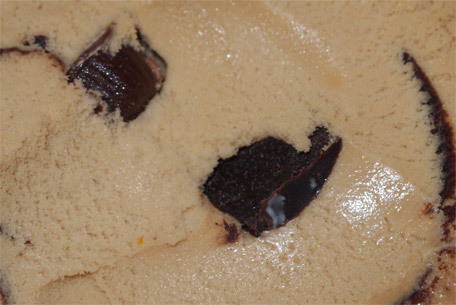 I mean, really stare at the tiny ripples in the ice cream. Do you see it? That's the pattern of a very icy (gritty) ice cream. Yet again, I've been dealt a terrible quart of Lovin Scoopful ice cream. I don't know how it always happens, but it always does. This was from a completely different store and I had really hoped for better. Unfortunately the poor texture makes it hard to truly taste the flavor here. The caramel just isn't that potent. I want to say the swirl takes over.... nah, I think the swirl cancels out the caramel. At times I want to say the swirl is imperfect, but then it you grab a big spoonful of it and you realize it's good a decent flavor and solid texture. i think if the base texture was there, i would like this one. I'm not really sure what to say right now. The fundamentals are all here, so why do I keep getting gritty samples? I really want to heavily endorse these products since they do donate 25% of profits to the special olympics, but I cant just let them slide either. How about this? If you've gotten a container with good texture, let us know, maybe I just have terrible luck. Thanks. This is my favorite flavor and cannot believe that it is so creamy and decadent and still lower in calories. I've never gotten a carton with ice crystals. I don't know what has happened with your purchases. @JoAnn: what state do you live in? I bet you are closer to their production facilities. Actually, I had the moose tracks and I thought it was spectacular! I loved the fudge ripples and the peanut butter cups! :3 After that, I realized that I'd rather have an ice cream with delicious mix ins rather than getting a standard base and using it to make sundaes. Although, I wouldn't mind a making a hot fudge sundae using either coffee or strawberry ice cream! I tried this for the first time. I thought the little cup things were supposed to be chocolate. They didn't taste like chocolate or caramel--didn't taste like much of anything. Ditto for the ice cream itself-- by the color, maybe the ice cream was supposed to taste caramel, but it didn't. The ribbon of chocolate in the ice cream tasted like that shell stuff you can buy that hardens once you pour it on the ice cream--not real chocolate. My container had huge hardened blob of this shell like stuff in the bottom. I love how you are supporting special olympics, but you need a better product. Wow! 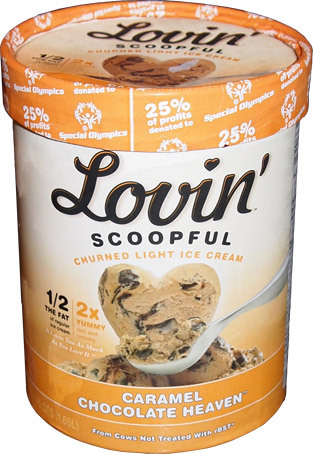 I cannot believe that any flavor of Lovin' Scoopful Ice Cream had any BAD reviews!! I have tried the Chocolate Caramel as well as most of the other flavors and they have all been EXCELLENT!! My fav flavor is Rockin' Raspberry Cheesecake which is truly divine!!!! Just the right sweetness and richness and so creamy!! I always smile when I eat it! And then I remember that their ice cream is REAL ice cream but with HALF the fat and my smile gets bigger. Then I think about how they are contributing a portion of their profits to such a deserving charity as the Special Olympics ... and a big grin breaks out on my face!! That makes this ice cream THE BEST from every angle! !